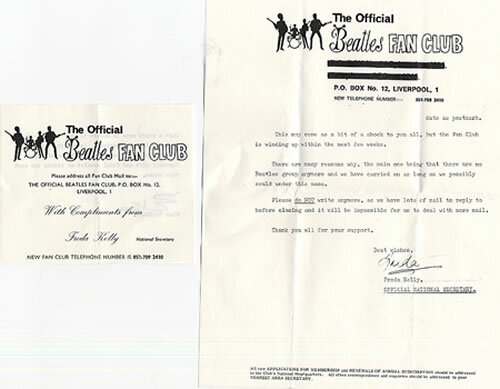 When the Beatles broke up in 1970, you might have expected the band’s official fan club to end as well. But, much as members John Lennon, Paul McCartney, George Harrison and Ringo Starr continued with solo careers, the club endured, as did its factions. There were George chapters and John chapters and so on in the so-called Apple Tree, and the main, Liverpool-based fan club focused on all things Apple Records-related. Freda Kelly – who swooned over the group at the Cavern Club as a teen – had been hired by manager Brian Epstein to serve as the club’s secretary in the Beatles’ early days and remained in her position after they split. Other people managed the individual chapters, one of which likely helped bring about the end of all the Beatles clubs. Pat Kinzer (later Kinzer Mancuso) ran the George fan club, which initially had been held in high regard by both Harrison and his father Harold. That’s because, in 1970, Kinzer had co-founded a memorial fund in honor of George’s late mother, Louise, who recently had died from cancer. Kinzer had encouraged fan club members to donate to the hospital that had treated Mrs. Harrison. But she ran afoul of “the quiet Beatle” in late 1971, when she published quotes from an interview with George’s wife Pattie, in which she claimed the couple were planning to adopt a child. Reportedly, Harrison was upset at his wife for speaking so candidly about their personal life. He was just as dismayed when he saw the details in the latest fan club letter. He sought out manager Allen Klein to tell him about his anger over the “garbage” he had read. Kinzer was so distraught about the end of the club that she sent letters to Harrison, his family members and other people involved in the Beatles fan clubs. One of the few response came from Kelly, telling her that she didn’t deserve sole blame for this. She went on to explain that there had been a meeting at Apple’s headquarters in January, attended by Harrison, Starr and others related to the Beatles and Apple Records. They were debating the future of the fan club and weighed its cost and value to a band that no longer existed. Then Kelly, who had grown up, gotten married and had a child during her Beatle years, shared some personal circumstances. The individual chapters sent out final letters in the months after that meeting. After almost a decade heading the official club, Kelly sent out one last notice in March, letting fans know that the organization would cease to exist at the end of the month. She also pleaded for no more letters to be sent to the fan club, because of the volume of mail that still required answering. According to a 2013 profile of Kelly in The Guardian, the former fan club secretary continued to answer letters for the next three years after the club ended. “You can’t just close a fan club overnight,” she said.